RETRO KIMMER'S BLOG: THE ROCK PACK WITH MICKEY THOMAS! Music Legends Unite! The Rock Pack Feat. 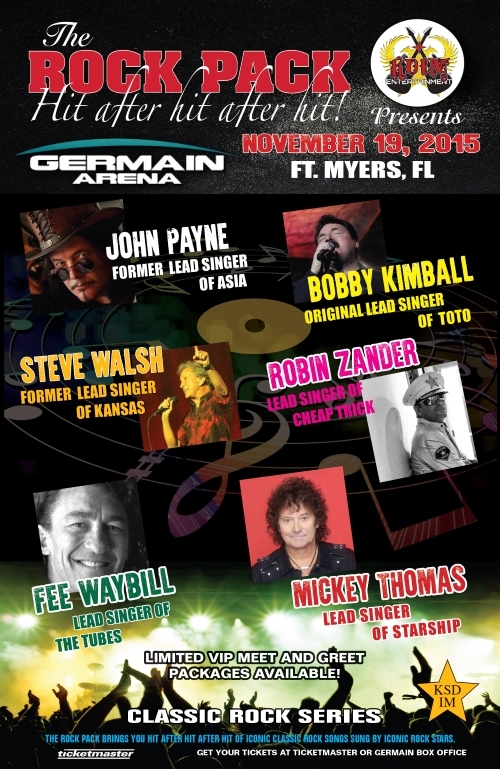 Mickey Thomas of STARSHIP, Bobby Kimball original lead singer of TOTO, Steve Walsh formerly of KANSAS, Robin Zander of CHEAP TRICK, Fee Waybill of THE TUBES, and John Payne formerly of ASIA! John Payne, former ASIA lead vocalist and co-creator of the #1 Vegas musical “Raiding the Rock Vault,” has created a unique new event. THE ROCK PACK concert is an incredible 80s rock extravaganza featuring the vocalists and the hits from six major classic rock bands.